Morrissey's upcoming concert film, Morrissey: 25 Live, will see a theatrical release on Aug. 29. The film, which was announced last month, captures the singer's intimate March 2 performance at Hollywood High School in Los Angeles, amidst a tour plagued by illness, postponement, and, ultimately, cancelation. 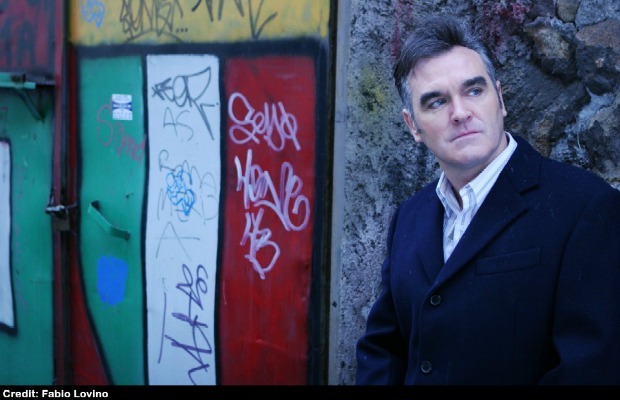 25: Live also celebrates Moz's 25h anniversary as a solo artist, and marks his first official film release since 2005's Who Put The M In Manchester? Following its theatrical run, via Eagle Rock Entertainment and SpectiCast, the film will see a DVD release. Currently, screenings are intermittent, but we've collected all announced U.S. locations below. Extensive U.K. screening information can be found here. For further updates and additional worldwide locations, keep an eye on the Last Of The International Playboys Tumblr. Below, check out a trailer for 25: Live along with all U.S. theaters announced so far. The number of screenings, length of the film's run, and times vary by date, so follow the links for more information. We expect more cities to be added in the coming weeks. Dallas – Studio Movie Grill Dallas Royal Ln. Additionally, Bow Tie Cinemas appears to have screenings planned in Colorado, Maryland, and Pennsylvania that are not yet announced. Between recent postponements and cancelations in the U.S. and abroad, persistent health issues, and uncertainty regarding future plans, Morrissey: 25 Live might be your best chance to catch a performance from the singer in any form for quite awhile.